The put in is at Natural Bridge park on the North Fork. 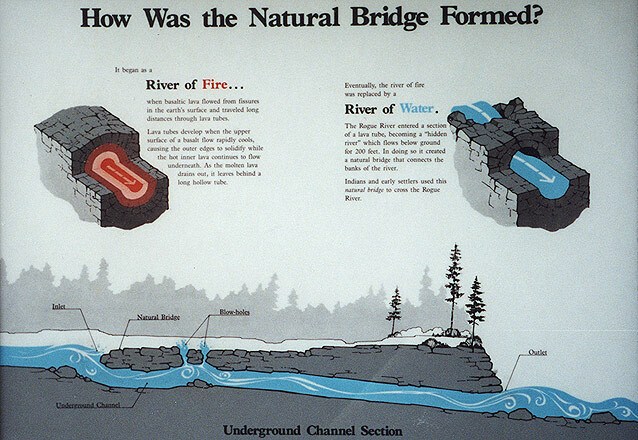 Before you unload your boats be sure to hike upstream and gape at the natural bridge itself- here the entire river disappears into a hundred foot long lava tube that has to be seen to be believed. Hiking around on the top of the bridge/tube is really creepy as the river surges somewhere below you and water wheezes and shoots through small vents in the bridge. 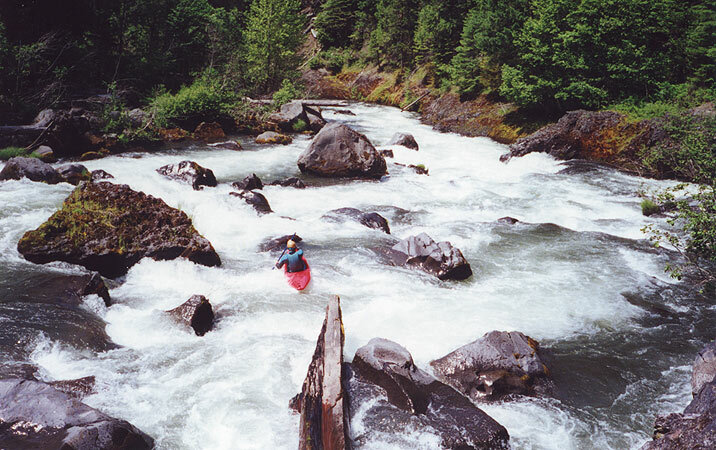 This drop is solid class VII+ and should only be attempted by paddlers who never wish to be seen again. Pete walks around on the Natural Bridge. This photo was taken from upstream- just above the bridge the river comes through a nice class IV drop and then rounds the corner and takes a dive that will leave any paddler who has ever run a blind corner on a first descent sick to their stomach! At the bottom of the Natural Bridge there is a burly class V drop that goes into a large cave on the left and a sticky looking hole at the bottom. I know a guy who has paddled into the cave at much lower flows late in the summer, but at this flow the cave looked horrible so we all decided to use the relatively easy put in below this first drop. If you do decide to run this drop you must seal launch right at the top of it- there is no warm up! Doug at the bottom of the class five rapid at the put in. The outlet from the Natural Bridge is just visible at the top of the drop. Just downstream from the put in the action starts immediately with a long, steep drop with some big holes and interesting moves, then the river assumes a pool-drop nature. 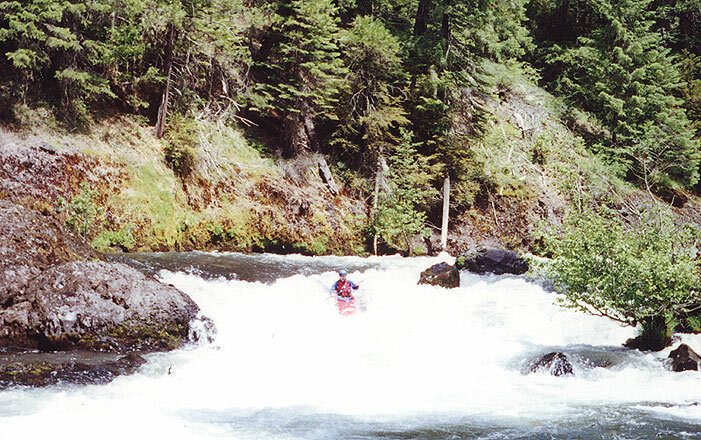 After some smaller rapids paddlers arrive at Karma, one of the best rapids on the river. Karma is very long and the last part isn't visible when scouting because the river takes a sharp left turn at the bottom. It starts with a wide open boulder garden which narrows into a fast runout with a couple of sticky holes and then the river takes an abrupt left turn and drops over an eight foot sloping ledge with weird cross currents. John ran this one first and caught an eddy below the boulder garden but I kept on charging downstream and ran the bottom ledge as well- I was pleasantly surprised by this drop because I didn't know it was there beforehand! John at the top of Karma. The eight foot ledge is just out of sight around the corner downstream. Jim runs the sloping ledge at the bottom of Karma. Below Karma are some easier drops and then the river slows and takes a sharp turn to the right. Paddlers need to be extra cautious here as there is a twenty foot class six waterfall a hundred yards downstream from here. Get out at the sharp right bend (the portage trail is clearly visible up the side of the hill) and portage the falls. You can scout the falls by hiking up the hill to where the river bends back to the left. Knob Falls has been run but was nicknamed 'Therapy Falls' by locals after an expert videoboater took a swim here that can only be described as a near death experience. "We call it Therapy because he probably needed some after that swim," a local paddler told me later. 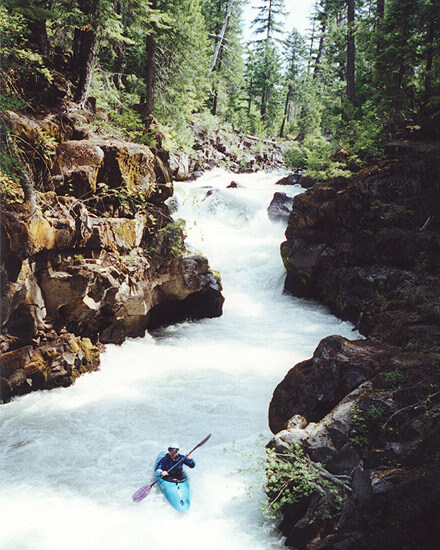 This swim and the subsequent rescue is in a kayaking video and John has seen it, though in the video the falls is labeled as being in Takilma Gorge and that is incorrect. Unfortunately I ran out of film so I have no picture of the falls. Immediately below the falls there are three rapids drops in a row. The first is pretty small and the second has some weird rock formations in the middle that can be avoided on the right. The third drop is just downstream and should be approached with caution as there has been wood here in the past. 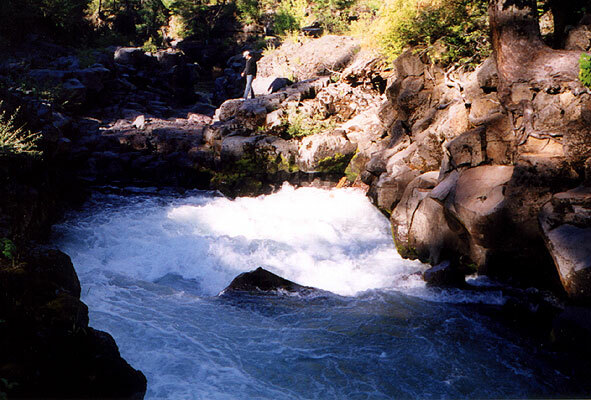 Here the river narrows to about twenty feet wide and plunges into a uniform hole that is easier than it looks. Actually, I never looked at it- everyone else got out to scout and when John gave me the thumbs up I went ahead and ran it without problems. At least one member of the party should always scout this rapid for wood. Below here the river mellows out and there are some long flat water stretches that are punctuated by a couple of very narrow slots that can be boat scouted if you have someone along who is familiar with the river. Be careful down here as a boat or wood could wedge in one of the slots pretty easily. The last drop is right above the Woodruff bridge takeout and can be seen from the bridge before hand. Here the river divides around a rocky island. The left channel drops into a gnarly undercut visible from the takeout bridge but the right side swings around and plunges over a really nice six foot ledge that is a perfect way to finish this run! Additional Concerns: See the warning about fat Californians above. We ran this section in early June on the same day as the Takilma Gorge trip report on this site. The flows were ~1000 cfs on Pat Welch's river bridge gauge. As far as I know this section also runs year round- I have seen this section in September when pretty much every other river and creek in Oregon was dusty and there was still enough water here! (To give you some idea, the picture of Pete hiking on the Natural Bridge was taken at the peak of the dry season mid September before the rains started.) Also, check out this very cool clickable map for the Rogue basin that shows reservoir levels and realtime flows at all of the gauges! Access- Follow the directions in the Falcon Guide to the put in for the Takilma Gorge section at Woodruff Bridge Campground. Woodruff is the take out for this run. To get to the put in, return to the highway and drive upstream until you see the sign for Natural Bridge park.